Collinwood Reads and Collinwood & Nottingham Villages Development Corporation (CNVDC) have joined forces! 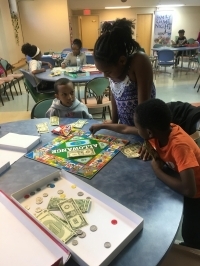 To kick off their partnership, they held a Family Game Night on Septemeber 28, 2018 at Five Pointe Community Center. The event, hosted by Literary Innovations, was jammed packed with literacy-based games, like bingo with colors, shapes, numbers, scrabble, and many others. There was a book giveaway where every child that participated received a new book and refreshments were served to all who attended. Over 35 residents took part in the fun! Join Literacy Innovations at the Collinwood Recreation Center located at 16300 Lakeshore Blvd, Cleveland, Ohio 44110, on November 9, 2018 from 4:00pm-7:00pm as they play educational games to enhance reading, math and problem-solving skills. You will also learn more about Collinwood Reads. There will be plenty of food and fun. We hope to see you there! RSVP at literacyinnovations.net or 216-481-7544. CNVDC can’t wait to bring more events with this exciting new partnership!